Thirteen Reasons Why is one of those books that it seems everyone has read, and I felt like I had an obligation to read it, though I wasn’t particularly eager to. I read plenty of issue-type books, but the suicide topic is one that I generally stay away from. The bully related suicide reports on the news re-ignited my interest in the book, as well as my recent read of Jay Asher’s The Future of Us. At the very least I thought I could learn something about suicide trigger symptoms, and how our everyday actions affect those around us. 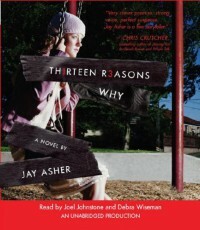 Thirteen Reasons Why is a perfect match for the audiobook format due to the cassette tape recordings used in the narrative of the story. And at just over six hours long, there was no excuse to put off listening to the book any longer.The story is that Clay Jensen comes home from school one day to find a package with 7 cassette tapes inside, recorded by his classmate Hannah Baker, who had recently committed suicide. She explains on the tapes that there are thirteen reasons why she took her own life, and that if you are one of the recipients of the tapes, you are one of those reasons. 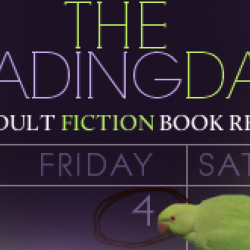 Clay spends the night listening to all the tapes, baffled to find out what he did to contribute to his crush Hannah’s depressed state.The book unfolds like a mystery, as the reader waits to find out what went wrong in Hannah’s life to cause her to take her own life, and how does Clay figure into the story. After acquiring a Walkman from a friend, Clay listens to the tapes and visits the sites Hannah references in her recorded confessions.Hannah’s tone in the book isn’t what I expected someone suicidal to sound like. She is matter of fact about the incidents and doesn’t sound particularly sad, but more vindictive. It’s not good or bad, just an interesting choice I thought. By themselves the reasons Hannah sites that took her on this path may not seem horrific, but the point I took is that these things have a domino effect that is difficult to climb out of. You never know what someone has been through what will take her to the breaking point. There is a lot of food for thought in this book, and it would make an excellent book club choice to debate the issues of bullying and suicide, and the role classmates, parents, and educators play.Debra Wiseman and Joel Johnstone narrate the audiobook and they both bring a lot of emotion to the story. In the book the two voices are layered so Clay reacts to Hannah’s story as he listens to the tapes. Since there are two narrators it made it easy to tell the two voices apart, and I wonder if that is confusing in the print version. There is a different person called out in each side of Hannah’s tapes, and part of the suspense is waiting to hear which tape Clay is featured in. Listening to the audiobook is like listening to the thoughts of the dead girl right along with Clay, something that makes the story even more haunting.